Does your kid have bad breath? What might be the cause? What can you do about it? Bad breath, or halitosis, is common in adults, but less frequently seen in children. When it's seen in kids, it is rarely a serious medical condition. Halitosis is caused by bacteria that live on oral debris and dental plaque on teeth. It gives off a rotten egg smell. The main odor causing sites in the mouth are the back of the tongue, the areas between the teeth and under the gum line. • Lack of adequate tooth brushing. Food debris and mucus secretions that may be accumulated on the tongue or between the teeth. • It may be due to a decayed tooth which needs immediate attention. • Forgetting to brush and floss twice a day. • It can also be caused due to stuffed sinuses or a lack of fluid intake. • An increased amount of protein in your kid's diet. 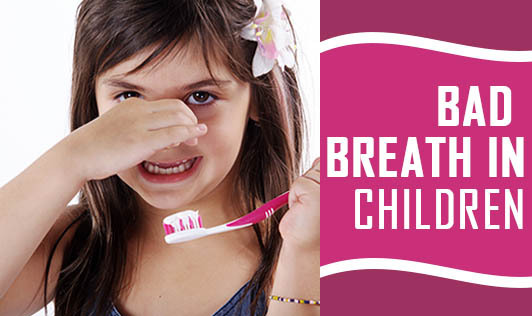 • Bad breath can occur in children who have taken antibiotics for a long time. • Teach your kid to brush the right way with a soft bristled tooth brush and clean the entire tongue each time they brush. • Floss twice a day to get rid of food debris that may have possibly stuck in between the teeth. • Pineapple juice sometimes helps to remove the foul smell. • Encourage your kid to drink lots of fluids throughout the day which will help keep the mouth moist. • Mint leaves, parsley and lime juice in water has been effective in cleansing the palate. • Get your kid to rinse her mouth out after meals. Make sure that your kid maintains his oral hygiene and gets a regular dental check up. Maintaining good oral hygiene is one of the most important things you can do for your kid. Healthy teeth are not only a feel good factor, but also enables your kid to eat and speak properly. Good oral health is a way to overall well-being.